As far as it is universally accepted, strong sports bodies in the world opt to live free and stay out of the clutches of government controls. For instance, the International Athletic Federation, the Fédération Internationale de Football Association or, simply FIFA, the International Olympic Committee (IOC) and the much closer to us, the International Cricket Council or, ICC, have categorically spelled out that none of them condones political interference. A 2012 Reuter report quoting sources close to the IOC said, “The IOC banned the Indian Olympic Association (IOA) over elections that could result in a tainted official taking over as the only candidate for secretary-general. The ban means an effective end to IOC funding the IOA, banning Indian officials from attending Olympic meetings and Indian athletes from competing at the Olympics, under their country’s flag. “Lalit Bhanot, who spent 11 months in custody last year, following corruption charges that plagued the 2010 Commonwealth Games in Delhi and who is out on bail, was confirmed for the post, after the rival faction pulled out ahead of elections. Yes, if a certain independent sports organisation feels there is undue political interference, it has all the right to take action against such interference. Sometimes, to overcome such prickly situations, some countries take certain countermeasures against such eventualities. For instance, according to Wikipedia, Gou Zhongwen is the Director of the State General Administration of Sports since 2017, in China, a country governed by its Communist party. He is also the head of China’s National Olympic Movement. This has been a workable arrangement for them. But, in Sri Lanka, the situation is different. 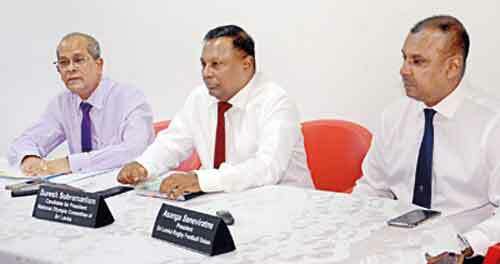 Under its democratic framework, the Sri Lanka authorities have formulated a Sports Law which was introduced in 1973, and that law has been amended on several occasions, but yet, that does not mean a sports minister has the right to interfere in an unjust manner not accepted by the international sports community. For instance, there was a huge furor when, last year, the Sri Lanka Badminton Association’s Interim Committee (IC) was banned by the Badminton World Federation (BWF). This was followed by the Sports Minister himself travelling to Dubai to meet the World Badminton authorities, to ask for a reprieve, so that the Lanka’s Badminton players would be able to participate in the April 2018 Commonwealth Games in Brisbane. This means, while professing about the ill effects of this practice of forming interim committees (ICs)and vowing that cricket would not have another IC, if he could help it, the minister himself set up an interim committee for badminton and now faces its repercussions. But, has that stopped the Sports Minister from interfering in sports? The best example is cricket’s BIA affair. Right or wrong, the Sri Lanka Cricket (SLC) officialdom works according to certain practices and it is not the first occasion a team was selected for an international engagement at the eleventh hour. But, when the national ODI team was deplaned and brought back to his doorstep, only to be sent back with a hanging addition of one player (not considered as a part of the team by the tour party during the ODI tour of India), it was a gross insult to the sports community of the country. In reality, does a Sri Lanka team, travelling overseas or, even taking part in an ICC event like an FTP sanctioned match, have to obtain the minister’s approval to take part? Then, when a team selected by the SLC machinery is stopped by a Sports Minister, isn’t it a gross violation of the ICC charter? Then, it beats me about the Malinga eventuality. Though we personally do not agree with his style, Malinga is temperamental like many fast bowlers and, generally, is not in the habit of mincing his words. At one point, he was not even afraid to give a piece of his mind when Minister Dayasiri Jayasekera started a hullabaloo about the girth of the bellies of Lankan international cricketers, which was taken up by none other than Malinga who started the “Monkey/Parrot gate”. In the same vain, at one juncture, Thilanga and his SLC bandwagon could not be without Malinga. So much so, there was a time when Malinga, without any official status, was brought to the SLC head table at a press conference, while the official Captain Angelo Mathews was injured and at home. But, since the Jayasekera-Malinga split has occurred, the aging fast bowler is being given the cold shoulder. At every juncture, the selectors say he is in their game plan, but cannot even find a place for the Bangladesh/ Zimbabwe triangular. Did anyone tell the selectors to go slow on Malinga? It’s intriguing to know how the new recommendations formulated by the Sports Minister’s advisory committee comprising Aravinda de Silva, Mahela Jayawardena, Kumar Sangakkara and Anura Tennekoon, could become a part of the SLC bandwagon. According to the ICC charter, the game should be governed by its membership. Yes, the SLC executive committee may be able to accept some changes recommended by the minister’s advisory committee. But, making a complete revamp of the cricketing structure looks a bit awkward. I mean the complete overall in the governing system tinkered by an advisory committee appointed by the minister of sports, may be a violation of the ICC charter. Because the reduction of the number of votes in SLC’s established system may be cause for concern – this may not get the approval of the majority of the vote holders in Sri Lanka’s cricket system. Then, at that point, if there is a disagreement between the Sports Ministry directive and the stakeholders’ rights, on whose part would the ICC be perched? Or else, did the Ministry of Sports get prior approval of the ICC to change the SLC mechanism, through a Bill passed in Sri Lanka’s Parliament? It is common knowledge that the two biggest sports institutions in Sri Lanka is the SLC and the National Olympic Association of Sri Lanka (NOCSL) — and only these two organisations have the wherewithal to make an impact internationally on such matters. Cricket, because it is the most popular and the most financially successful organisation in the country. The NOCSL, because it covers almost the whole gamut of sports, big and small, besides cricket, and is the IOC’s local arm, and hence, does not come under the purview of the sports ministry, according to reliable sources. The whole episode of the present NOCSL conundrum sparked off because, in 2013, the Sports Ministry tried to intervene with some of the aspects of the Olympic charter, and the ensuing reverberations are still pending. It took a good part of three-years for the cohabiters now, to sit and agree on the next NOCSL elections. Now, under the guidance of the IOC, the NOCSL has earmarked February 23 for its next AGM, and the rival faction under Rohan Fernando, would come forward to contest the post of President, after the incumbent president Hemasiri Fernando said he will not seek re-election this time. On Tuesday evening, the Hemasiri Fernando faction which is looking for a suitable candidate to replace him, came up with the candidacy of tennis ace Suresh Subramanium, with Maxwell de Silva coming in as Secretary General. The duo had the backing of more than 18 Associations’ delegates, out of the 31 possible, at the inauguration at SLTA headquarters. Now it is a complete contrast to the situation where, last week, it was said the Minister of Sports would not allow Maxwell de Silva and a few others to contest due to various discrepancies in their eligibility. However, at the launch of their campaign, de Silva confidently stated he or any others who are on that list would be able to cast their vote under the IOC regulations. This means the Ministry regulation holds no sand, under the Sports Law, when it comes to Olympic stipulations. Interesting times! It would be a secret ballot on February 23, and there could many hopper eaters or Nelsons of ’96-fame on that day.